Forty-three Loudoun County Public Schools participated in this year’s food drive. 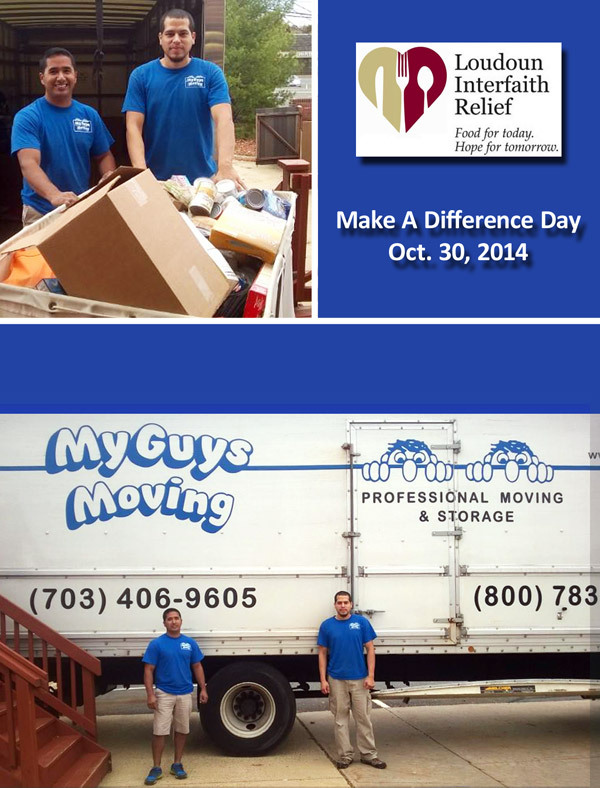 My Guys Moving & Storage helped Loudoun Interfaith Relief collect and transport a total of 10,597 pounds of food for this worthy cause. Here’s a partial list of some of the schools that participated: Algonkian Elementary, Balls Bluff Elementary, Monroe Tech Center, Cool Springs Elementary, Evergreen Mill Elementary, Frances Hazel Reid Elementary, Frederick Douglas Elementary, JW Tolbert Elementary, Lucketts Elementary, Rolling Ridge Elementary, Sycolin Creek Elementary, Harper Park Middle School, Tuscarora High School, JL Simpson Middle School, Seldens Landing Elementary, and Loudoun County High School. Copyright © 2005-2019 My Guys Moving & Storage, Inc. All Rights Reserved.